A new study to be released later this year will reveal long-haul truck drivers are being pushed to the limit to make ends meet. The Transport Workers Union has been given the preliminary findings of a study by University of NSW Professor Anne Williamson and Rena Friswell from the NSW Injury Risk Management Research Centre. The study, funded by WorkCover NSW, shows drivers are frequently forced to break driving regulations due to workload pressure. 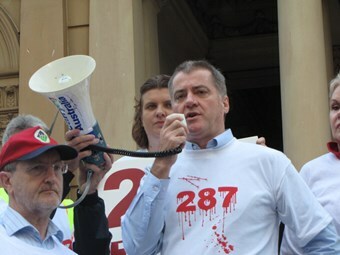 "Anne Williamson’s study shows that drivers on long haul are working an average of 68 hours a week while a almost a third are breaking all driving laws and doing more than 72 hours a week," TWU National Secretary Tony Sheldon says. "We also have only 25 per cent of drivers paid of waiting times, and almost 60 per cent of drivers surveyed are not paid for loading or unloading. This pressure adds up and that is why we are seeing 60 per cent of drivers admit to ‘nodding off’ at the wheel over the last 12 months." While the study is not due for release until later this year, the TWU is using it to reiterate its call for a new remuneration structure for the trucking industry. "Truck drivers have no guarantee of full-cost recovery as it is. We need a system of safe rates across the country, where drivers can get all costs back for rising charges and fluctuating fuel prices, otherwise we are going to see rising economic pressure cause further unsafe practices," Sheldon says. Sheldon says trucking operators must improve the wages and conditions of drivers or risk recruitment problems as the freight task doubles over the next decade. He says the industry has an ageing workforce on its hands. "As these people retire, companies do need to look at recruitment for the future and the up-training of younger drivers – but it is hard to attract people to the job if there is little financial rewards," Sheldon says. "Lifestyle and family life is also adversely affected." Sheldon says the industry will struggle to attract young people if driving causes family pressures through poor pay. Prime Minister Julia Gillard was due to release a paper in July from the Safe Rates Advisory Group outlining recommendations to reform pay rates. The National Transport Commission in 2008 recommended government intervention in the marketplace on the basis truck drivers lacked the ability to negotiate a sustainable rate. It also criticised incentive payments such as the cents-per-kilometre rate. Once released, the paper will be open to six weeks of discussion to give the trucking industry the opportunity to respond to the recommendations. The authors of a 2008 study on pay rates, Professor Michael Quinlan and Lance Wright QC, criticised those who deny a connection between low pay and poor safety outcomes. They say critics provide "little if any research or credible evidence to discount or provide alternative explanations to research indicating that such connection exists".